Candle light gives a room a relaxed romantic mood and the soft reflected light given off by these elegant candle wall sconces are most effective in inducing such an atmosphere. Their defuse light is created by the use of a special verre eglomise mirror which is made by water gilding the back of clear glass and burnishing it until it gives an appealing soft reflection. This gilded mirror is complemented by the use of traditional, true to period, gilded finishes which makes a stunning combination that will add a touch of class and refinement to any room. 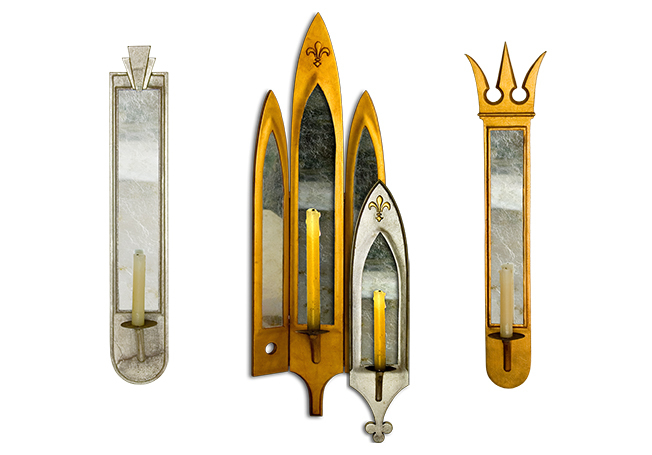 Click on any of the candle wall sconces below to get a better idea of the individual sconce and their reflective mirror.